Hire Larry Klein as Financial Speaker for your next financial services conference for: Registered Reps, Insurance Agents, Investment Advisors, Financial Planners, Money Managers. Larry Klein has assisted 30,000 financial professionals to rapidly increase their clients and income. He is the foremost national authority on marketing financial services to America's wealthiest nicheseniors. Mr. Klein is a CPA (retired) and was one of only 3300 CPAs in the US to hold the Personal Financial Specialist (PFS) designation. He holds an MBA from Harvard Business School. He was a million dollar producer at a major securities firm and he achieved a million-dollar net worth after just 9 years in the business. He can inspire your people to do the same! As a financial speaker and educator committed to raising the technical and businesses competency of financial advisors, he has co-created the Advanced IRA Rollover and Distribution Training (with Ed Slott) and the Certified Retirement Financial Advisor Training. Larry has been an invited keynote financial speaker for leading organizations such as Wells Fargo, John Hancock, Charles Schwab, the NAIFA Annual Conference, the Million Dollar Round Table, State Farm Insurance, American Express, Bisys, Investors Capital and many more. He has been interviewed on CNNfn and in industry publications including On Wall Street, Registered Representative, The Agents Sales Journal, CPA Wealth Provider, Advisor Today, Research magazine, and National Underwriter, and writes columns for Horsesmouth (www.horsesmouth.com) and On Wall Street Online. His articles have appeared in National Underwriter, Advisor Today, Research Magazine, NAILBA magazine, On Wall Street and others. In these industry publications, he counsels financial services professionals how to use smart and efficient seminars, direct mail, direct response and advanced marketing to obtain substantial increases in their income. He teaches the psychology of why people buy and how they develop trust so that advisors quickly learn to attract more and better clients. Larrys distinguishing mark as your keynote financial speaker is that while he is entertaining, he provides your audience with tactical tools that make a difference on Monday morning. 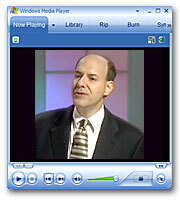 While most speakers talk about "what to do", Larry tells your advisors "how to do it." Your producers won't just be talking about Larry's presentation for a week after his talkthey'll be implementing his distinctions for years in their business. He's a financial speaker that opens up new opportunities for action. He is author of Retirement Investing, Asset Protection and Wealth Preservation, 400 Greatest Financial Jokes, Marketing Financial Services to Seniors, How To Be a Million Dollar Producer, and What They Don't Tell You About Handling Your IRA and a number of other publications on financial topics. Have one of the nation's leading authorities on marketing financial services speak at your next financial conference, annual meeting or association event. 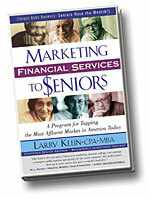 Larry Klein, CPA (retired) Harvard MBA has spoken at dozens of financial conferences on his book, Marketing Financial Services to Seniors, on marketing financial products and services, using direct mail and advertising and how any financial advisor can be a marketing machine and never lack clients. The impact to your organization is substantial when each individual begins to use Klein's methods to increase their revenue. Do you want just a motivational speaker who will make a great impression, speak in generalities and have people feel good for 30 minutes? Then don't hire Klein as your financial speaker! When he speaks, the audience is not only entertained and energized, they walk away with tactics to implement on Monday morning for an immediate increase in results. He gets barraged with questions, as the audience wants more even when his time is up. He's a professional speaker with only one goal—to get results for the audience. As a result, he is listed and retained by several speaker bureaus. Over 20,000 financial professionals use his marketing systems and there's a reason—he's a topnotch marketer with an uncommon message that makes the difference. 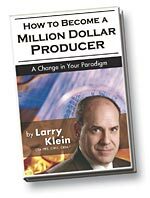 At your next financial services conference, don't settle for just an entertainerget mileage and profit for your producers by selecting Larry Klein as your next financial keynote speaker.